A visual representation of the tool options as described below. A radio telescope is a remote sensing device whether it is earth-based and pointed at the sky for observing celestial objects or on an aircraft or satellite and pointed at the earth. 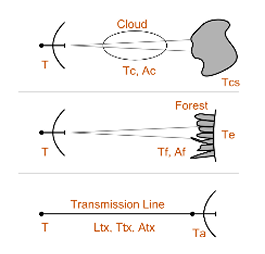 The equation assumes that the radiation detected or sensed by the telescope originates in the objects being observed, known as passive remote sensing. This tool calculates the temperature (measured or that of the object) for a number of remote sensing applications. The applications along with their respective equations are listed below.